This details how to upgrade Plesk using either the GUI update tool or command line via SSH. Prior to June 26, 2012, DV 4.0 servers were provisioned with Plesk 10.4. Parallels has released significant updates since the early release dates of these products, and these updates are available for free to current customers. The latest version of Plesk available to DV 4.0 users is 12.5. Keeping Plesk up-to-date is a vital way to take advantage of the console's latest features and avoid any potential security pitfalls that can arise when running outdated software. This article will show you how to upgrade your Plesk panel to 12.5. As with all guides for major server changes, there will always be edge cases that experience errors which can break things. While we have tried to account for possible fail-points, there is no way to guarantee with 100% certainty that the following commands won't cause more harm than good. 1.Make a back-up of your entire server, preferably using the Snapshot Backup tool. A Snapshot Backup will give you the option of restoring to your old server setup if anything goes wrong during the upgrade. 2. Reboot your DV server. 3. Be comfortable with the idea that there is always a possibility that you will need to re-install and/or revert to that backup data. Under Server Management on the left side, select Tools & Settings. Under the Plesk section of the Server tab, select Updates & Upgrades. For Plesk versions 11.5 and older, you will want to look in the Panel section of the Server tab, select Updates & Upgrades. A new window or tab will open, depending on your browser settings. If you are upgrading to the latest version of Plesk, click on Install or Upgrade Product. If you are already on the latest version and just want to upgrade components, click on Update Components. Click the Continue button to upgrade to the latest Plesk version. You may receive a warning about certain memory thresholds being exceded, especially if your DV has hit memory limits in the recent past. This may indicate something that requires additional investigation, but may also reflect recent memory issues rather than current ones. In most cases, you can safely select "Continue" when receiving these messages. Your upgrade will begin. Please be patient. This process can take up to 20 minutes to complete, depending on your Internet connection. Once completed, you receive a confirmation message. Log into your Server Administrator Panel. The Plesk Server Administration Panel. Click for a larger view. From the left menu, click on Tools & Settings. Click on Tools & Settings. Your upgrade will begin. Please be patient. This process can take up to 20 minutes to complete, depending on your Internet connection. Once completed, you will receive a confirmation message. Upgrading via SSH is the easiest method for more advanced users, and provides the most detailed output. While the Paralells repository will allow you to upgrade to newer versions of Plesk, it is highly recommended that you upgrade your DV's version of Plesk via the (mt) Media Temple repository, as this version is tested on and optimized for the DV platform. The autoinstaller will guide you through the next steps and offer a verbose output of the installation process. You can add the nginx component at any time after the upgrade in Tools & Settings > Updates & Upgrades > Add Components. Once the component is added, you should run the Reverse Proxy Server (nginx) service in Tools & Settings > Services Management. The DV - Making It Better series provides optimization tips to help you get the most out of your DV server. What's new in Plesk 12.5? This article details how to upgrade Plesk using the GUI update tool. The latest version available is Plesk Onyx. Keeping Plesk up-to-date is a vital way to take advantage of the console's latest features and avoid any potential security pitfalls that can arise when running outdated software. 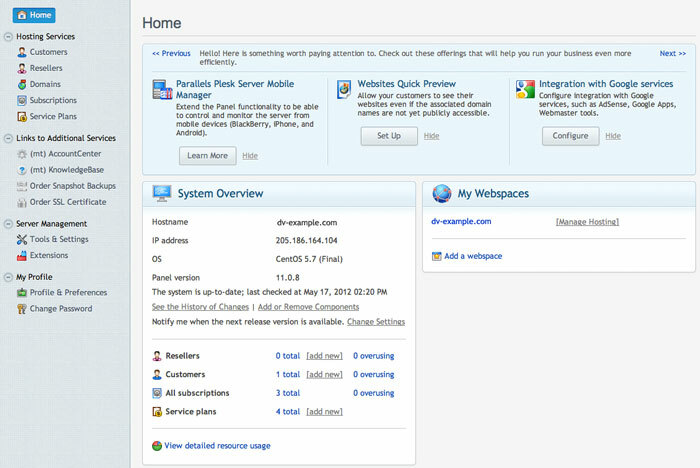 This article will show you how to upgrade your Plesk panel to the latest version. Plesk Onyx does not support CBM, and future versions will not integrate it. If you upgrade to Plesk Onyx without uninstalling CBM, CBM will stop working. For more information, please see the official Plesk documentation. 2. From the menu on the left, select Tools & Settings. 3. 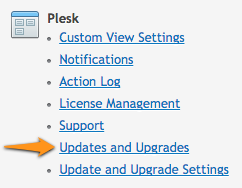 Under the Plesk section, select Updates and Upgrades. 4. A new window or tab will open, depending on your browser settings. If you are upgrading to the latest version of Plesk, click on Install or Upgrade Product. If you are already on the latest version and just want to upgrade components, click on Update Components. 5. Click the Continue button to upgrade to the latest Plesk version. Plesk Onyx gives you the ability to use Nginx exclusively. Navigate to Tools & Settings > Services Management. What's new in Plesk Onyx?